An article regarding our company was published in Nikkei Industrial News dated November 24, 2005. Copper-Iron Alloy CFA (Cu-Fe Alloy) is the material that holds the excellent characteristics of both Copper of 6000 years of history and Iron of 4000 years of history. Copper-Iron Alloy CFA is highly expected to develop a new road into an electronics material as an electrical conductive material, an electrothermal material, a structural material, a magnetic material and as a spring material, which lures attention as a material that offers new business opportunities. Copper-Iron Alloy CFA has the characteristics of both copper and iron, and has attracted the attention as a material that can widely contribute to the industrial worlds such as the electron, electricity, and machines. Moreover, it has been spotlighted as an electromagnetic shielding material for its high performance in electromagnetic shielding effect, which mutually demonstrates the electromagnetic characteristic of iron and electroconductive characteristic of copper. As the result of the longtime research and development, The Copper-iron alloys inc. has become the only one company that developed the copper-iron alloy that had always been defined "impossible to produce" with unique and original technology. This excellent Copper-Iron Alloy material is a product that can be used to enhance characteristics that has never before been possible or to implement higher quality in products or to find a breakthrough in the technological limit. 1. Implementing EMC with CFA Electromagnetic Shielding Material. The Copper-iron alloys inc. has successfully completed our new CFA product, "CFA-shield 9001 series" and "CFA-shield 5001 series" and ready to introduce them in the market. Compared with copper foil that has long been used, Copper-Iron Alloy CFA can further enhance the electromagnetic shielding effect. Especially in the Electromagnetic Shielding Effect Test Result, an improvement of 20db minimum and 40db maximum in electromagnetic shielding effect has been measured when 0.2mm-thick copper plate and 0.1mm-thick CFA plate were compared in the frequency range of 100kHz - 1GHz. Of course, effect can be further improved with a thicker the plate. When a plate is used with rolling directions crossed, even higher electromagnetic shielding effect can be achieved. In our New "CFA-shield 9001 series" and "CFA-shield 5001 series," we have prepared a product that can be easily used for electromagnetic shielding with the use of double-faced adhesive tape. The excellence of new CFA products can be found not only in their electromagnetic shielding effect but their mechanical strength with its rigidity that is performed even when it's being thin. Our new CFA products being an alloy of copper and iron, it will improve the thermal dissipation functionality of shield cases that shuts up heat inside. The new CFA products has achieved further improvement in thermal conduction and earthing function as they have made soldering and brazing especially easy. 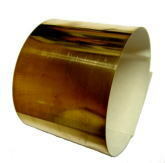 They perform excellent effect as an electromagnetic shielding material that also releases the heat of electronic parts. The new CFA products can be processed into a line in the selected diameter and can be applied as a construction material for electromagnetic shielding rooms and a wire-net type shielding material. Filamentation of Copper-Iron Alloy is possible starting from ø50µm and thus can be easily applied as electromagnetic shielding by wrapping or attaching it to atypical parts. In addition, it can be woven with other type of fibers so that materials of atypical form can be easily covered. Moreover, it can be used as materials for electromagnetic shielding curtains, walls or interior. It can also be built in glass to produce electromagnetic shielding glass. Making the use of the strength and spring of Copper-Iron Alloy, it can be applied as the robot cables or movable wiring. The CFA new products, with their strength, spring and the feasibility to process into fine-filament, can be applied for shred-resistant shielding cables with high electromagnetic shielding effect . The CFA products being excellent in depletion-resistance, machining, forging, casting and uniformity, they offer economic effect that can never be obtained with other precious materials. As an excellent environmental and low-cost material, CFA new product has expanded its application to such areas as Information Storage Media, Conductive Materials, Conductive Strucutral Materials, Thermal Conduction Materials, Conductive Spring Materials, Radiation Fin, Magnetic Materials, Heat-exchange Parts (high-tension), Lead Frame materials, Connector Pin (conductive property, machine strength), Conductive Screws, Terminal Materials, Motor Cases (electromagnetic shielding, machine strength), Conductive Brushes (show spremacy in wear performance and spring), Slip Rings, Pantographs・Train Overhead Wires, Roller Bearings, Relay Parts, etc. Decide on CFA10 to 90 based upon the weight ratio of material. Contact us at the following e-mail address for any technical consultation. Sample of our new CFA products, "CFA-shield 9001 series" and "CFA-shield 5001 series" are available on your request. Details of new products can be find here. - achieved by The Copper-iron alloys inc. with the use of an alloy of copper and iron.